Use the new S Pen to open designated apps remotely. We will explain S Pen remote controls in detail in this guide. Another new feature of Galaxy Note 9 S Pen is the default colour of the screen-off memo matches the colour of the S Pen. 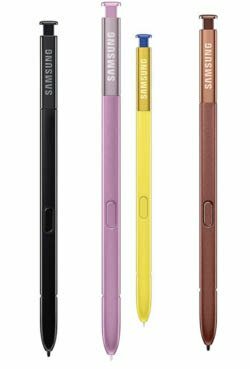 Samsung called it the signature colour of the S Pen. On Galaxy Note 5, Note 7 and Note 8, the colour of the screen-off memo is always white (on the black screen). On Galaxy Note 9, the colour of the screen-off memo now matches the colour of the S Pen (except for the black S Pen which creates white screen-off memo). If you have a yellow S pen, the default colour of the screen-off memo will be yellow. For a purple (lavender) S Pen, the colour of screen-off memo will be purple. You can disable this colour-matching options (signature colour) for screen-off memo and use the white colour as in previous generations of Galaxy Note devices. Please be reminded that the signature colour in the screen-off memo may look nice when you are writing. But after you saved them, the black background colour becomes white, and therefore the colour may look ugly in Samsung Note or S Note. How to charge the Galaxy Note 9 S Pen? As a Bluetooth device, Galaxy Note 9 S Pen needs to be charged before you can use Bluetooth related features. But you can still use Galaxy Note 9 S Pen just like the old S Pen even when the new S Pen is fully discharged. Only Bluetooth related new functions (mainly S Pen remote) will not be available in this situation. All other features and functions (e.g., tapping the screen, using air command …) are still available. Charging Galaxy Note 9 S Pen should start automatically whenever you put the S Pen back into the S Pen slot. No external chargers needed. Currently, this is actually the only way to charge Galaxy Note 9 S Pen. And charging the new S Pen is super fast. Putting Galaxy Note 9 S Pen into S Pen slot for 40 seconds will power it for 30 minutes of use. The technology behind is the supercapacitor. Galaxy Note 9 S Pen uses supercapacitors, instead of a battery to power it. Therefore, it can be charged almost instantly, and you do not need to wait for the charging. Even when the Galaxy Note 9 S Pen is fully discharged, you can still use it for normal S Pen features (just like old S Pen in Galaxy Note 8 or Note 5) except remote controls. Charging Galaxy Note 9 S Pen is almost instant. S Pen slot in Galaxy Note 9 is the charger for S Pen. How to check Galaxy Note 9 S Pen status (charging and connection status)? When the S Pen is taken out of the S Pen slot, Galaxy Note 9 will detect it. A Bluetooth connection between the S Pen and Galaxy Note 9 will be established automatically. Of course, if you disable S Pen remote control, you are supposed to use the new S Pen exactly as the old one. No Bluetooth connection will be established. S Pen remote is enabled. S Pen is taken out of the slot. 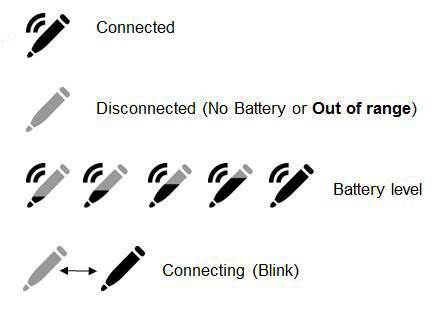 The meaning of the connection and battery status is explained shown in the following picture. In some regions, there is a notification for S Pen when it is taken out of Galaxy Note 9. But in most regions, Samsung removed the notification in Galaxy Note 9. For the meaning of other icons, you may check this guide. There are no changes in the layout and buttons of Galaxy Note 9 S Pen (compared to the Galaxy Note 5, 7 and 8 S Pen). The 3 functional parts are S pen nib, S Pen button and S Pen release button as illustrated in the picture below. S Pen nib functions differently when touching the screen or hovering over the screen. When the S Pen nib touches the screen, you can use Galaxy Note 9 S pen to write and draw on the screen. You can also use it to perform any touch operations as if it is your finger. When the S Pen nib hovers over the screen (without touching the screen), you may access additional info of the underlying object. For example, you may access air view features in some apps when you hover the S Pen nib over the screen. Please check this guide if you want to change the Galaxy Note 9 S Pen nib, or want to know which S Pen nib is better for you. Use S Pen remote. As explained in the S Pen remote guide, you can press the S Pen button to launch a designated app. When you are using an S Pen remote-supported app, you can press the S Pen once or twice to perform certain operations (aka app actions). Access Air command. When you hover the S Pen nib over Galaxy Note 9 screen, you can press the S Pen button to access air command. Select items. When the S Pen nib touches Galaxy Note 9 screen, you can press and hold the S Pen, then drag the S Pen over items to select them. S Pen release button is for you to remove/detach the S Pen from Galaxy Note 9 (read on …). How to detach the S Pen from Galaxy Note 9? As mentioned earlier, Samsung has adopted a new design for the S Pen since Galaxy Note 5. You need to press the release button to detach the S Pen from the S Pen slot. To remove or detach the S Pen from Galaxy Note 9, as shown in the animation below, you need to press the S Pen release button first, then pull out the S Pen from Galaxy Note 9. If you try to pull out of the S Pen without press the release button to disengage it first, then you may damage the S Pen. How to store Galaxy Note 9 S Pen? You will not lose the S Pen. You can charge the S Pen. When you put back the S Pen, make sure, the S Pen nib, not the release button, goes in first. If you find it is hard to insert the S Pen back to the slot, you should check whether you insert it in the wrong direction. How to use Galaxy Note 9 S Pen remote control? Please check this guide on the using Galaxy Note 9 S pen remote control. How to change nibs for Galaxy Note 9 S Pen? There are two types of S Pen nib in the Galaxy Note 9 box. please check this guide to learn how to choose and change nibs for Galaxy Note 9 S Pen. How to use Air command on Galaxy Note 9? Please check this guide (coming soon) on the using Air command on Galaxy Note 9. How to use screen-off memo on Galaxy Note 9? Please check this guide (coming soon) on the using screen-off memo on Galaxy Note 9. Do you have any questions on the new Galaxy Note 9 S Pen? If you have any questions on the new S Pen with Galaxy Note 9, please let us know in the comment box below. The community will help you find the answer.